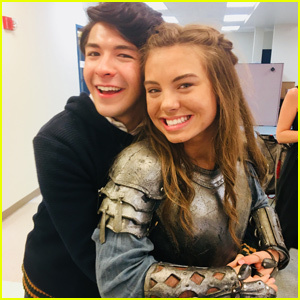 Caitlin Carmichael Photos, News, and Videos | Just Jared Jr.
There’s an adorable guest star this week on Dwight in Shining Armor! 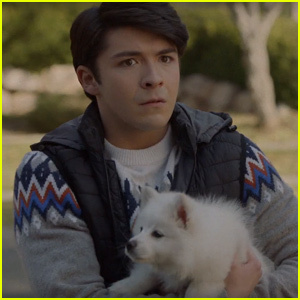 During the episode, Dwight (Sloane Morgan Siegel) tries to get Gretta (Caitlin Carmichael) to adopt a puppy, but all is not what it seems. When Gretta arrives at animal adoption center, she becomes terrified of a fluffy little dog…who may or may not actually be a man eating creature! Make sure to also check out JJJ‘s exclusive behind-the-scenes photos from the show’s set! Dwight in Shining Armor airs on Mondays on BYUtv. 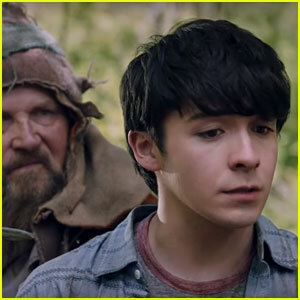 Sloane Morgan Siegel finds himself in an unexpected position in the new trailer for his upcoming series Dwight in Shining Armor! The actor stars in the trailer alongside co-star Caitlin Carmichael. In the show, Dwight (Sloane), a 21st century teen, falls into an ancient, underground chamber and lands lip-to-lip with Gretta (Caitlin), a gothic princess who has been magically sleeping for a thousand years. Dwight’s “kiss” awakens Gretta, her court magician, Baldric, as well as scores of medieval villains, and makes Dwight her de facto champion until her hordes of enemies are defeated. Season one of Dwight in Shining Armor will premiere in Spring 2019 on BYUtv. Meet Caitlin Carmichael, the new star of Netflix’s new original film, Wheelman! The 13-year-old starlet will be starring alongside Frank Grillo in the film, where she did all her own stunts for. “I did all my own driving stunts in the movie in a 1982 Porsche 911 stick-shift car,” Caitlin told JJJ. Mind you, she was still only 12 at the time of filming! Learn 10 More Fun Facts about Caitlin below and catch Wheelman TOMORROW, October 20th, on Netflix. I have a 5-pound Maltese named Tallulah that travels with me everywhere I go. She loves bacon and dressing up! Before I go to set, I listen to music that reminds me of my character. My personal favorite types of music are acoustic pop, musical theatre, and hip hop.